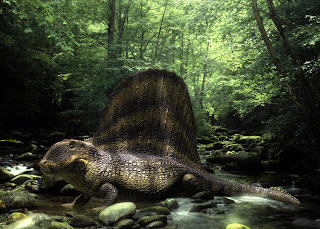 Life Before the Dinosaurs: Dimetrodon. Dimetrodon was an apex predator that lived in the Permian period. There are fifteen species of Dimetrodon. It had a huge sail on its back, which was probably used to warm Dimetrodon up faster than its prey could, so its prey would not be fast enough to escape. 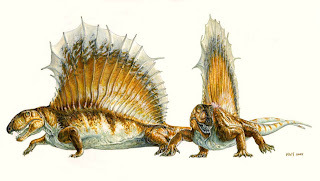 Dimetrodon's sail could also have been for attracting a mate. The sail was made up of spines covered in flesh, and each spine was sticking out of a single vertabra. Dimetrodon probably ate animals such as Edaphosaurus. It had two kinds of teeth, canine teeth and teeth for shearing. Dimetrodon and other synapsids were the first tetrapods to have more than one kind of teeth, like modern mammals do. 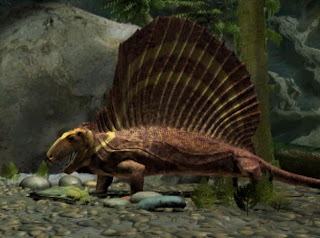 Dimetrodon was one of the top predators of its time. It probably ate whatever it could get, including other Dimetrodon. If it couldn't find enough food, it may have eaten other Dimetrodon. ... but Dimetrodon was NOT a dinosaur, right? Dimetrodons are rather interesting - I personally always wondered what the sail actually looked like. If the theory that it was used to attract a mate is true, I like to think that they were very colorful like peacock tails. Dimetrodons were synapsids which means they were more mammal-like than dinosaurian. Yes, that is true. Dimetrodon was not a dinosaur. But it did act a lot like a carnivorous dinosaur, because it ate whatever it could get and was an apex predator. But Dimetrodon does look a lot like a dinosaur.